What are we looking for in the poetry we read, write, and listen to? Literary stimulation, solace, self-expression, community? On the page, the computer screen, face to face? Some combination of the above? These are the questions that rose to the surface as I interviewed Billy Brown, poet, organizer of monthly Fixed and Free poetry readings, and one of four editors of Fixed and Free: poetry anthology 2011, published by Mercury HeartLink in 2012. The book is a finalist in the anthology category of the New Mexico Book Awards to be announced on November 16th. Before turning to the book and how it came into being, I’d like to introduce the Albuquerque, New Mexico poetry scene and Billy Brown’s role it. I met Billy Brown early in 2012 when I came to Albuquerque to explore the possibility of relocating here. Albuquerque generously welcomes and supports poets. Billy Brown is an especially friendly and welcoming representative of the Albuquerque poetry scene. There are a number of monthly poetry readings at various venues and I quickly found my way to several of them. The first venue I attended was Fixed and Free, which was begun by Billy Brown in 2008 to fill the vacuum created by the demise of a previous Albuquerque venue. Billy avoided poetry until later in life, having had a not unusual and discouraging experience with a high school English teacher. Actually, he is a bit of a renaissance man. A retired math professor and INTEL employee, he now teaches several statistic courses at the University of New Mexico; tutors math students, sings in several local vocal groups; runs a baking and catering business; coaches high school speech/debate teams; is active in community theater; and, finally, organizes the monthly Fixed and Free readings with featured poets and an open mike,as well as a quarterly Poetry Open House in his home. In 1996, after his 18 year old daughter, Elizabeth, was killed in a motor vehicle accident, Billy found himself writing poems to express his grief. He shared these with others in the grief groups he attended and he began reading other poetry. His morning ritual still includes reading poetry: in anthologies as well as some on line services such as Panhala (http://www.panhala.net/Archive/Index.html) and Poetry Daily (Poets.org poetnews@poets.org). His favorite poets are Mary Oliver and Pablo Neruda. About four to five years after his daughter’s death, he was ready to move beyond grief groups and grief poetry, though he continued his coaching and theater work as a way of honoring his debater/actress daughter’s memory. His need for self-expression led him to community poetry venues. His devotion to helping others express themselves eventually motivated his creation of Fixed and Free readings. As it happens, on a friend’s recommendation, I had just finished Gregory Orr’s book of essays, Poetry As Survival about the time I decided to review the Fixed and Free anthology and interview Billy Brown. Interestingly, Billy Brown shares Orr’s premise that poetry is an important form of therapy for the initiated and uninitiated alike. This belief has driven his devotion to the Fixed and Free community since the monthly readings began in an Albuquerque bike shop by the same name. The parallel between fixed and free traditions in bicycling and poetry is reflected in the publisher’s cover design of the book. Eventually, the community found an affordable, venue where it has regularly met for several years. The process by which the anthology came into being is very interesting. After a few years, a number of regular readers encouraged Billy to consider creating an anthology to showcase the community’s writing. In the end, the anthology was edited by three local poets, including Billy. Stewart S. Warren, an area poet and publisher, handled production and publication details. The book consists of seventy-nine poems by the same number of poets. Only regular participants in the Fixed and Free community could contribute—a requirement which increased attendance at the monthly readings. Each poet submitted three poems. Since the editors were committed to publishing a poem by each poet, an editor coached those whose work needed some fine tuning. Editors individually rated all submissions. The rankings and final choices were hashed out in committee meetings. According to Billy, the process evolved organically but, if you are considering editing an anthology he recommends that you be as conscious as possible about your process and choices. A single editor can be more efficient but when the inevitable overload and procrastination weighs in, it can be good to have several editors to create a sense of accountability and keep the process moving. On the other hand, a team of editors will likely run into inevitable relationship issue and challenges in the process. After publishing the Fixed and Free community anthology and organizing monthly readings and quarterly open houses for five years, Billy is pondering how to decrease his involvement in sustaining the group’s gatherings in a way that can keep it alive in the community. Whatever the final resolution to this challenge, Billy has made a noteworthy contribution to Albuquerque’s poetry community and the broader body of published poetry. Caroline LeBlanc turned her energies toward making art and writing after thirty-seven years as a Nurse Psychotherapist. In September she relocated from Northern New York to Albuquerque, New Mexico where she enjoys the regular sunshine and the rich cultural community. Her chapbook, Smoky Ink and a Touch of Honeysuckle was published in 2010. Recent work can be found in War, Literature & the Arts and The Louisville Review. A former Army Nurse, she continues to lead writing groups for active duty military, veterans and their family members and looks forward to having more time for her own writing and studio work once her home is set up and Lola, her rescue puppy settles down. I met Billy Brown early in 2012 when I came to Albuquerque to explore the possibility of relocating here. Albuquerque generously welcomes and supports poets. There are a number of monthly poetry readings at various venues and I quickly found my way to several of them. The first venue I attended was Fixed and Free, which was begun by Billy Brown in 2008 to fill the vacuum created by the demise of a previous Albuquerque venue. 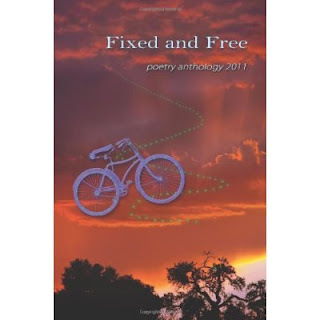 Fixed and Free: poetry anthology 2011 is a collection of seventy-nine poems with conscience and heart. Edited by Billy Brown, Gregory L. Candela, Elaine Schwartz and Stewart S. Warren, it contains poem by forty-seven women and thirty-two men from Albuquerque, New Mexico. Arranged alphabetically by author, the collection holds together in meandering themes. More free than fixed form poems, the latter include ghazals, sonnets, regular stanza verses and prose poems. Many poems reflect aspects of Albuquerque and New Mexico at large, from its environmental qualities to its Catholic Hispanic culture and ties to Mexico. Others take the reader to different states or continents entirely. Themes include nature, daily life, racial and economic inequities, terrorism/ war related concerns and gender issues. The book is a finalist in the anthology category of the New Mexico Book Awards to be announced on November 16th. In this entry, I will quickly introduce the reader to a few poets before devoting a few pagers to a more in depth discussion of the writing of several other poets. Billy Brown’s poem, “Roberta,” is a tender nineteen line thanks to a young violinist who reminded him of his dead daughter who was also a violinist. 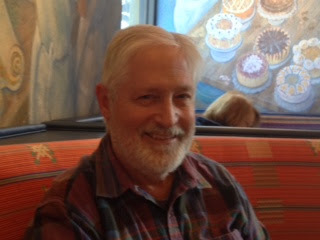 Kenneth Guerney is an Albuquerque poet and editor of the New Mexico poetry anthology Adobe Walls. His satirical poem, “Becoming Impossible,” offers a different twist on the miraculous. Is it coincidence that the human speaker, suspicious of eternity, limits his poem to 7 quatrains—a number just shy of 8, which, on its side, is the symbol for infinity? Numerology suggests that the number 7, uneven and therefore unbalanced, resolves itself into the even and complete number 8. Not only does the poem’s content impede such a resolution, the structure of the seventh stanza, with its break away last line, impedes it as well. Now, what are some popular associations with “Roadrunner?” Well, if you live in New Mexico as Guerney and this reviewer does, you will on occasion see one of the long, tall, Roadrunner birds race along the sand or tarmac from point A to point B. I am thrilled each time I encounter one of these unlikely creatures and am never quite sure if it is running away from or toward something. Although the Roadrunner can fly to a perch or over an obstacle, it is predominantly ground- dwelling, like the poem’s speaker. Perhaps you also recall the Looney Tunes cartoons and the eternal struggle between Roadrunner—that speedy bird—and Wile E. Coyote who inevitably suffered what should have been fatal encounters with Roadrunner. Yet, Coyote repeatedly comes back to life only to be outsmarted time after time. Roadrunner often has something to do with Coyote’s would be demise. Coyote was the trickster predator, but Roadrunner, with his carefree enthusiasm, always did him one better. The speaker in this poem shares a devil-may-care defiance with this Roadrunner. More recently, there is the Roadrunner high speed internet cable company that services parts of the US but they do not service New Mexico so it is not likely to be an association in this poem. Still, the image is apt for an internet company since users do manage to “fly” in the infinite ethers while never actually leaving the ground. In the last quatrain, the speaker reveals that what he is after is assurance that he will not be tricked out of an abundance here by false promises about an abundant afterlife. before I join any one religion over another. How does one “visit heaven before death?” Perhaps by seeing the universe through the wave-particle relativity of quantum mechanics referenced in the poem’s fifth stanza. Perhaps through a Roadrunner mentality, that looks for heaven on earth and refuses to take promises of the hereafter more seriously than the abundant fun of now. And we did as much as we could with the materials at hand. The son has displaced the father and the speaker seems to feel some satisfaction about this. However, the last couplet reveals the speaker’s deeper ambivalence about two things: the price of being a “strong” man and the sadness about the once omnipotent father’s aging—and, by implication, the speaker’s inevitable aging. I was the body that my brain could still abuse. And my father, once capable of anything, was old. One is left with the impression that an inevitable part of being a man is to dominate and drive one’s body—even to the point of abuse—in the service of a will to achieve. Just as inevitable is the diminishment of this ability to challenge limitations as one ages. In its own way, each is just as sad as the other. While this poignant poem stands strong on the father/son story, the twist in the last couplet introduces a stunning depth. Carol Moscrip is a published poet and teacher of creative writing in high school and college. Her poem, “Shadows,” takes the reader back to the speaker’s childhood experience of her father’s return from World War II. This poem is of particular interest to me as a former Army Nurse and spouse, mother of a soldier, and leader of writing groups for active duty military service members, veterans and family members. In this free verse poem, Moscrip beautifully captures how the realities of war affect families as well as military personnel. Moscrip’s poem has the dream like quality of early childhood memories—memories of the speaker’s four year old self during World War II. Indeed, the speaker’s first reference is to a dream. Capitalization is reserved for the first word of each line, the first person “I”, “Mother”, “Father”, home description (“Victorian”), and place, (“San Francisco”). Punctuation is sparing and there is no period at the end of the poem’s sixty-six lines. “Shadows” mirrors the experience of families who currently have family members in the military just as accurately as it represents the speaker’s experience so many years ago—the worry for the one in danger, the effort to connect through imagination when distance makes touch impossible, the tensions and challenges of reunion, the desperate, private whispers in the dark and the “everything is OK” daylight face shown to family members and the public alike. The “single shaft of light [cast] its spot…/Mother sat bolt upright/ with an electrified stare.” The light has gone from a whisper to a glaring, electrifying spotlight illuminating the paradox—to wife and child—of a returning hero/husband/father who “held his head and wept,/ just come home from war to find/ the savings all spent.” It is not clear how much his tears are over his combat experiences or his fractured dream of returning home to peace and prosperity. It is striking how common the problem of management of finances remains for military couples. It may be that the military person unrealistically imagines the accumulation of bank balances, forgetting the financial realities of civilian life. Or it may be that the home-side spouse has indeed mismanaged funds the military spouse earned by risking his/her life. Of course, during World War II, almost all of the stateside spouses were wives. Now, it could just as easily be a husband as a wife. The language in these lines is compelling. Father is not a man but a “shadow of…anguish.” The child, “a shrimp” as a child is often called, has become not only a small person, but a morsel to be served on a platter as so many children are served up to help solve problems in their parents’ relationship, or served up to carry emotional burdens their parents cannot carry “well enough.” There’s no blame here, just a stunning description of how frail children can feel devoured by the sufferings of their frail parents. The child’s experience of the father as intruder magnifies as she wonders, “where would he sleep, not here in my too small bed.” These lines caught my breath the first time I read this poem. Were we going on to memories of sexual abuse? Thankfully, this was not the case for, “after a silent moment he moved on/…[to take] refuge in my mother’s room.” Interspersed with the child’s recollection of events, are lines that must surely grow out of the years of the speaker’s internal replaying and reflection upon this pivotal experience, for though the child may have had a visceral apprehension of the situation, a child could not formulate the astute observations about the father that follow. The vulnerability of this warrior Father has exposed his despair and child-like need for solace. The child imagines him being comforted by Mother, much the same as Mother has comforted the child, and perhaps in his fragile state, that was the comfort offered. However, an adult reflecting on this observation likely imagines the comfort and maturing influence of long unavailable sexual congress between this long separated couple. Even as a child, and certainly as the reflecting adult, the speaker “knew/ that I could not comfort him.” Only now does the speaker tell us that this is “my first memory of him ever.” Clearly, it is a memory burned into the speakers psyche and one that shaped her psyche as she matured. This solitude, so powerfully imaged as a dark shadow in a doorway that cannot be lightened, moves the father from fragile to intruding to remote. What a meal for a “shrimp on a platter” to digest! Then, as now, adults often act as if these surreal events—the war, the tearful homecoming, the financial crisis—never happened. Friends gather. Father talks of a swing and a dog for his little girl and likely never again talked of his crisis with such vulnerability. What is the dream here—the crisis of the night or the illusion in the daylight. But bodies, especially young ones, are exquisitely attuned to discrepancies between verbal and non-verbal messages, between what is said and what is viscerally communicated. And so, the child “stood transfixed as if posed/for a photo, anxiously curious” about which reality held the greater truth—“the sunlit room” that put a bright face on everything or the Father’s “shadow seated at the same place.” A shadow relegated to the shadows, it is “now small upon the wall” even though it held his immense pain, which the child had witnessed the night before. Moscrip’s poem depicts how people can attempt—and fail—to bury agony in ordinary life. At the risk of charges of political incorrectness, Aaron Trumm’s persona poem, “Walking Dead” brings a woman’s agony, in a militant Muslim culture, into the light. At the anthology‘s celebration event last March, Trumm’s delivery of the poem from memory was riveting. Trumm is another published, slam poet who has competed nationally. At one time, he was ranked 10th in America. He is also a musician and owns an Albuquerque recording studio ( www.nquit.com ). “Walking Dead” is an eighty-two line free style poem with irregular rhyme patterns, lines and stanzas. Punctuation, consisting of a few commas, is sparse. A couplet begins the poem. The two lines, together and individually, stitch the poem together. From beginning to end, the imagery graphically as it progresses from hands, to cold stone and rain, to sand and ashes, to letters, to nothing, to bullets and blood, climaxing in a mother’s despair. This is not a poem that talks of redemption. This is a poem which, by virtue of the stark integrity of its speaking, is redemptive for those with the courage to listen. The repetition, the rhyming, the rhythm and the imagery propel the reader/listener forward through the heaviness of the topic. The fact that a son wrote this poem also invites the redemption of other sons and mothers who undervalue their own daughters and womanly suffering. One can only hope that someday men and women in such oppressive cultures will have the desire, courage and ability to stand for woman’s value and truths. And while we’re at it, let’s hope that humans will find a way to turn from war as a solution for differences. The last poem we will explore is “Gulf Ghazal” by Yasmeen Najmi. Najmi is an environmental planner and a widely published poet. Her poetry reflects her deep feelings for ecosystems. The poem is set in the Louisiana gulf. It concerns the physical and spiritual nature of the place and how human’s and the space they occupy impact each other. In particular, it is a tribute to the life in the Louisiana bayous that mourn the 2010 Gulf Oil Spill. The ghazal is a traditional Persian form which owes its popularity in English to Pakistani and Indian poets who wanted to reclaim the ancient form. Strictly speaking, a ghazal consists of unenjambed couplets which share an end refrain (rhadif). The word preceding the refrain is the word that rhymes through the poem. The refrain is set in the last phrase of the two opening lines and repeats at the end of each couplet. Each couplet must be able to stand alone, in structure and content. The cohesiveness of the form is in its structure and pattern. Another distinctive feature is that the poet refers to him/herself by name in the last line of the poem. It is a challenging form, particularly in English. The “Gulf Ghazal” layout on the page consists of three, rather than two, line stanzas. It is difficult to know if this was a printing necessity or the poet’s intention. I would judge the former since, when one examines each stanza, the content and rhythms break nicely into couplets. Otherwise, Najmi has met most of the technical requirements of the form: the refrain, “thin places” is repeated verbatim. The words preceding the refrain rhyme well: “grow/toes/closed/those/through/below/roux/our.” There are two minor variations from the formula: the insertion of the article, “the” between the rhymed “closed” and the refrain in the second stanza, and the context and placement of the poets name in the last couplet. Though it would be nice to have a visual couplet layout for the reader who counts on such things, the variations do not disrupt the texture or flow of the poem when spoken, which is how a ghazal is traditionally delivered. The refrain, “thin places” is defined in the author’s note as “a physical place on the landscape where the veil between this world and the next is thin—a place you understand intuitively.” The poet heard this definition on public radio. The sixth and next to the last stanza indicate the event that likely got the radio people and the poet thinking about thin places—i.e., the gulf oil spill of 2010. The third stanza eases us into imagery related to the oil spill. It follows life forms that “settled in all those thin places” of sky, earth and water as “earth’s blood crept to shore, staining, straining….” “Earth’s blood” is, of course, the oil pumped from her heart, deeper than the sea. The fourth stanza magnifies images of wild life, confused by the eruption of oil that that darkened the ocean. Again, there is the multi-valance definition of “thin places” here when we imaging thin eels literally passing between and among tangled tree roots and the “slimy” feeling most people get just thinking about eels. around shores, dark clouds and truth spun below thin places. I find this imagery compelling. The once fertile and “ferel” bayous have become oily, “gluey graves” for wildlife. The “chastity belt” of levees implies a barrier against the toxic oil which brings death rather than fertility. Just as the oil spill and the “spin” of oil officials are “dark clouds,” so also the oil spreads into “dark clouds” along the “thin places” of coast and waterways. In Jungian psychology, transition places such as coastlines are referred to as liminal spaces—a place where realities meet and vie for dominance, where truth is nebulous and awareness is cloudy. Najmi describes not only the physical state of the oil infested waters and shores, but also the psychic state of the perpetrators, victims and observers of the disaster. The last two stanzas ground the generalities of the previous stanzas in the person of one man in one place, “Old Joe at Boutte’s Bayou.” Old Joe can fix only a “poorboy sandwich.” While “poorboy” fare is a southern tradition, the reference also underscores that the oil spill has made poor boys of all inhabitants of the ecosystem. When the poet’s name is spoken in the last stanza, she seems to be more a listener than a speaker, which is a transgression against the traditional ghazal formula. It reads as if she is being told the story, rather than telling it herself to the reader/listener. I had to read this a number of times before I realized that, by now, the poet is herself in a “thin place” which, if not a new experience, she now experiences it in a new way. By letting Old Joe be the speaker in the last as well as the penultimate stanza, the poet, Yasmeen, is bowing to a man, a people who have inhabited the “thin space” of the bayous for years, even generations. “‘In these prowling bayous’ “they know the most about their “thin places.” It is a break from the ghazal formula but it is a break that creatively serves the poem and leaves a devotee of the form in her own “thin place” as she wrestles with what the poet did here and why. I selected the seven poems presented here because they deeply touched me. They also hang together thematically around questions of life, death and eternity even though their style and content differs greatly. Their quality is representative of the other poems in Fixed and Free, which I encourage the reader to discover.